When most surfers who know the coast of northern Baja intimately, first heard of the Trump-Baja project, their first reaction was, “Who would crazy enough to build or buy a condo on Baja’s most polluted beach.” They were referring to the fact that Donald Trump’s planned beachfront resort will be built just north of Baja’s Punta Bandera, where 30 million gallons of sewage are discharged daily on the beach. This discharge is the same one that sends sewage north and closes beaches in Imperial Beach and Coronado during the summer months. This sewage also pollutes Baja Malibu, one of Baja’s best beach breaks. The rapid development of the Baja California coastline between Tijuana and Rosarito has outpaced the development of sewage collection and infrastructure. International developers have continued to develop the coast without contributing to necessary infrastructure improvements. The result is an environmental and health crisis as sewage and wastewater are dumped directly on beaches. At least Mexico is not hiding its sewage problems from developers. Amazingly, there is a honest assessment of the Rosarito -Punta Bandera – Tijuana area on the state of Baja California website. Irongate Development, the Los Angeles-based Corporation run by Adam Fisher (formerly of REW Holdings, TD Capital, and NMS Capital Partners), on Dec. 8 sold 80 percent of the to-be-built condos in what will be three large condo towers. It cannot avoid fixing the sewage problem on its beachfront. The developer is required to use an onsite desalinization plant to obtain potable water for its project. 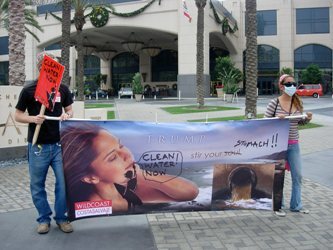 Unless Irongate works with the state of Baja California, the city of Tijuana and Mexico’s Environment Ministry to fix Punta Banderas sewage problem, the Trump Condos will be sucking in water filled with Tijuana’s foulest waste. Hopefully Irongate and Donald Trump can become leaders among Tijuana’s private sector and help solve this issue (which can be easily be fixed by running an outfall pipe out to deep water). Because unfortunately, instead of staying home to fix their problems, Tijuana’s ruling elite is now fleeing to San Diego to avoid the mess they’ve made back home.